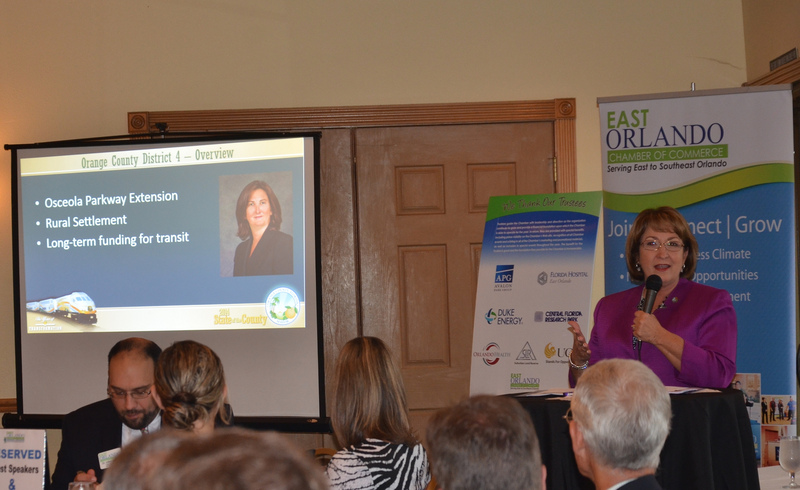 Orange County Mayor Teresa Jacobs recently joined members of the East Orlando Chamber of Commerce as the keynote speaker for their signature monthly member luncheon. Mayor Jacobs provided highlights from her recent 2014 State of the County address and showcased other successful projects in District 4. During her 30-minute speech, Mayor Jacobs took citizens on a journey highlighting the outstanding achievements of the region and the many milestones the community has accomplished together making Orange County the best place in the world to live, learn, work, and raise a family. She also highlighted how central Florida is becoming a sports Mecca with the new MLS soccer stadium coming to Orlando as well as the United States Tennis Association’s (USTA) new state-of-the-art facility at Lake Nona. The planned 100-plus court, 63-acre tennis center scheduled for completion in late 2016 will house the USTA’s Community Tennis and Player Development divisions which will be accessible to youth and recreational players, collegiate and professional tour level athletes. The USTA Player Development division plans to move its national headquarters from Boca Raton to the new Orlando facility to provide greater opportunities for the next generation of American tennis champions. A rebroadcast of Mayor Jacobs’ 2014 State of the County address can be viewed on Orange County’s website. A collection of photos from the East Orlando Chamber of Commerce event are available on Flickr for use by the media.